Part 3 you’re half way through my pain series!! 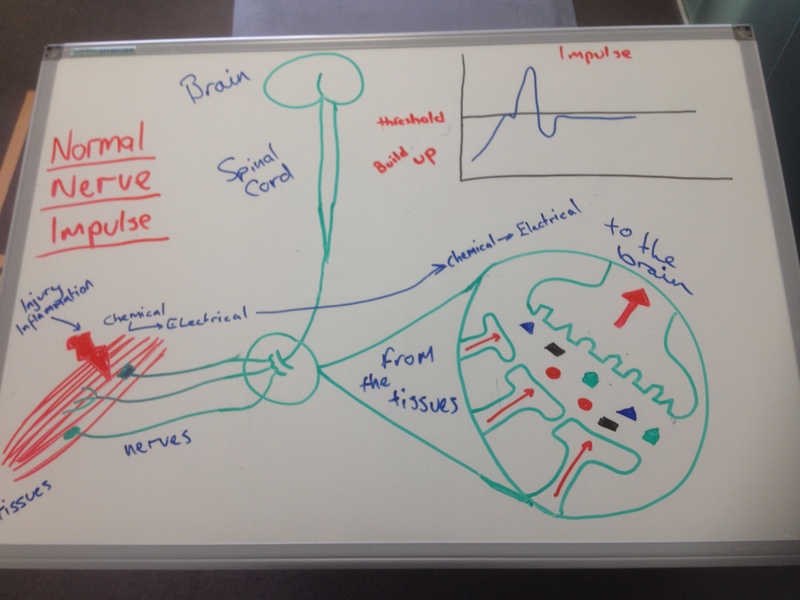 Lets take a journey through the nerves and the spinal cord up to the brain. It’s a complex journey, which we know more and yet so little about but research is unraveling those mysteries. In part 2 I talked about pain being a sensory and emotional experience and that there was a biological process to pain. In this post I will talk about that biology and the adaptations or plasticity that occurs in the nervous system. Persistent pain is classified as pain that is experienced for 3 months or more. Imagine being in pain for 3 months? That’s quite a long time! Now imagine being in pain for 6 months, a year, 3 years! No one wants that least of all people who are suffering with long term pain. Let’s start with a metaphor of how our senses and experience can cause our brain to adapt to try and understand pain. Do you remember this definition? The difference of course is that pain is regarded as an unpleasant experience yet the delivery mechanisms are not too dissimilar. Remember pain is important to our very existence it may be unpleasant but it is a very necessary part of our survival. So lets take that journey up the nerve to the spinal cord and to the brain. Nociception is the process of sensory neurons detecting pain-producing stimuli in the tissues (reference, reference). A Nociceptor is a clever little blighter because unlike our other sensory nerves i.e. auditory nerve, it has an adaptive ability to be set off by mechanical, chemical and temperature stimuli (reference, reference). Now that is really important because when we sprain or strain tissue, have inflammation at a site of injury or feel a significant increase or decrease in temperature on our skin we need these nerves to send a danger message up to our brain. When this happens these nerves become sensitized. Nociceptors are the small diameter slow conducting nerve fibers that send messages up to the spinal cord and brain. The journey continues into the spinal cord from the peripheral nerves. Connections in the spinal cord called synapses turn electrical stimuli into chemical stimuli back into electrical stimuli. The spinal cord then takes the information up to the brain. Let’s take a look at the spinal cord synapses. The nociceptor carries information to the spinal cord and releases chemicals into the synapse to bind with special receptors on the neuron (2nd order neuron) in the spinal cord. If there is enough chemical release it reaches a threshold and then sends the message up to the brain. There are a number of nerves converging on the one 2nd order neuron all wanting to send their information up to the brain. The brain is always interested in what is going on around you so in the situation where a danger message arrives the brain wants to know more so it asks for more. The more channels that open in the spinal cord the more opportunity for the danger message to get to the brain. This causes the threshold to drop making it easier for the message to get to the brain. The more this process continues the more sensitized the nervous system becomes. This is often called central sensitization (remember we are talking about persistent pain). The whole system can get wound up creating a perpetuating cycle. This explains why when you touch, move or load a body part it can be painful. This is referred to as allodynia – a stimulus that was not previously painfully sensitive is now painful. It can also explain why you might be more sensitive to pain and that it is widespread from the injury. This is called hyperalgesia – Hyper – elevated/increased, algesia – sensitivity to pain. 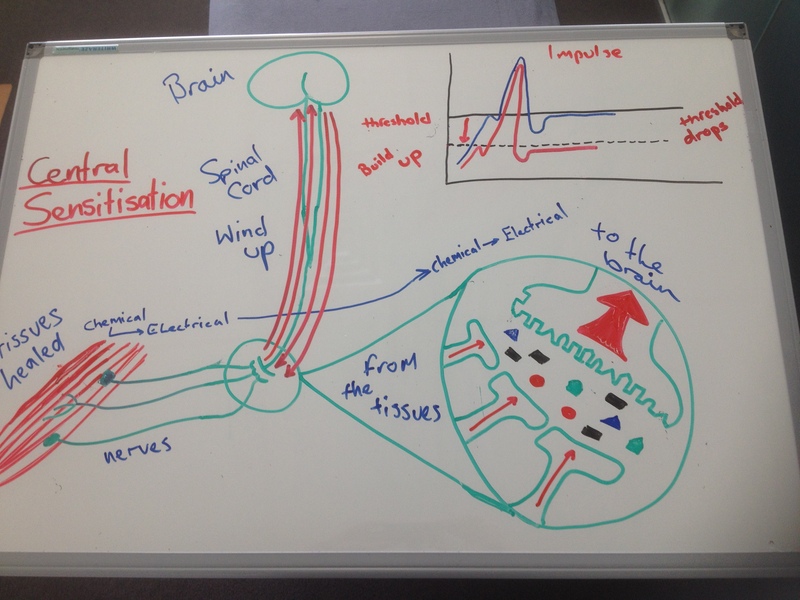 So your spinal cord adapts…… Below is just one of the ways I educate patients. It might seem like a complete mess but when drawn out as a story it helps you to understand the process. Continuing our journey up the spinal cord we reach the relay center in the brain called the thalamus. The thalamus links the messages from the spinal cord to the conscious and subconscious brain and so a neurotag is created/stimulated. A wee reminder/recap…… the nervous system is the delivery mechanism, the brain has the final say. You can experience pain when there is no tissue damage. You can have lots of tissue damage and not experience pain. We have to get out of thinking that everything is related to our tissues. It’s not your ankle that experiences pain when you sprain it, you experience pain. 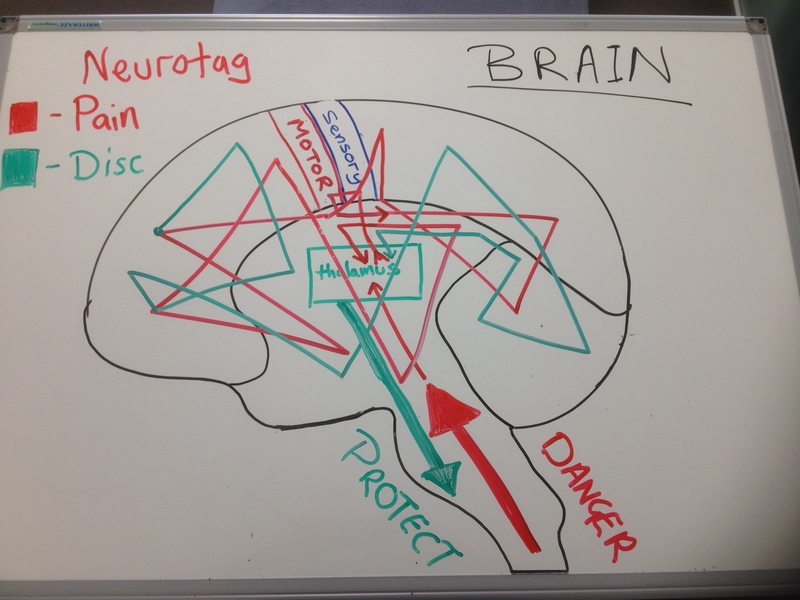 When it comes to experiencing pain it relates to a neurotag (reference, reference, reference). A neurotag is a construct of why, what, how we feel, do, taste, move, create, react and interact, sing and express our habits, remember the music example at the beginning of this post? We have neurotags for everything that we do the more we repeat certain movements, behaviours, actions, the stronger the neurotag becomes. Interestingly, these neurotags communicate (reference). 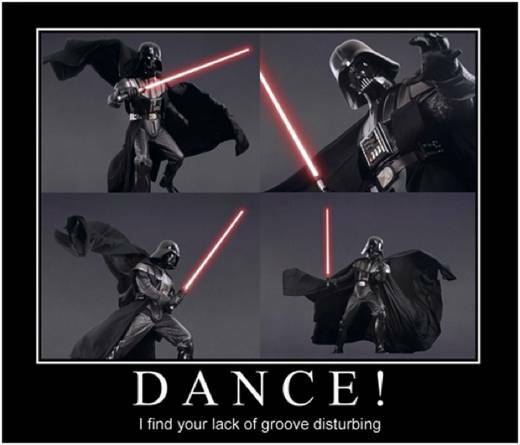 Take for example the star wars music neurotag (there I go again!) it might be linked to a memory of ‘playing with your children’ neurotag, which might be linked to a ‘happy’ neurotag. It works the same way for pain, a belief neurotag about backs being vulnerable might be linked to a disc neurotag, which might be linked to a pain neurotag. It you experience it again and again you reinforce it meaning it becomes stronger and stronger. Another metaphor – Imagine we did a blind wine tasting, I place 10 different glasses of wine in front of you and I ask you to tell me the difference between smell and taste in each one, do you think you could tell me exactly? (wine connoisseurs are exempt) Practice it for a couple of months and you will probably be able to determine the difference between at least a few (I’m not condoning excessive alcohol consumption here!). Reinforce the stimulus and the brain gets better at recognizing it. This ties us nicely into neuroplasticity. So what is neuroplasticity? Well simply put our brain and nervous system can change, where we thought we were hard-wired as we approached adulthood, neuroscience has informed us that our brains are plastic and our nervous system is adaptable throughout our lifetime (reference). New connections are being created all the time in our brains and in terms of sensory motor function this is specific to when we learn a new skill, experience a new sensation or feel pain. This shows that the connection between the mind and body is very real unlike what was first proposed in the specificity theory (look back to pain part 1 the origins). When we experience pain we avoid moving your injured limb, right? We attempt to move it, it hurts, so we don’t move it, we try again it hurts, you avoid moving it. A perpetuating cycle, right? Well this can create the neurotags that I was previously talking about meaning that they can become more and more cemented. The threshold drops making it easier to experience. Of course our cognitive thoughts, behavior, beliefs and more all have a significant involvement in the experience of pain. A very interesting phenomenon is phantom limb pain, it explains the mind-body connection. The representation of our sensory and motor body lies in our brain. Imagine if you lost your hand? That’s a large part of your sensory and motor cortex representation. People that suffer phantom limb pain can experience excruciating pain in their amputated limbs. Think of a severed electrical cable that is sparking not delivering, passing on or receiving a signal. The nerves at the end of the amputation can do that too and because there is a representation of the hand in our brain phantom limb is very real and very painful. There is a lot more too it than that but this can explain how you can again experience lots of pain and not even have a limb, which explains how Descartes theory and even the pain gate theory are not useful when it comes to explaining pain. A wonderful book by V.S. Ramachandran called phantoms in the brain is a fascinating and insightful read into the workings of the mind and phantom limb pain. So you can see that a lot goes on when we delve into the biology of pain. I’ll be honest I have only scratched the surface. It is a very complex area and is a very individual experience. There are a number of complex interactions that occur within the human body from other systems including the immune, endocrine and autonomic nervous system (reference). I hope this post has given you an understanding of the journey of pain and what some of the processes are behind its production. The nervous system interacts with all body systems to create a pain experience, which highlights the vast scale of what you experience and what clinicians face when attempting to explain the mechanisms. In the next post I will be talking about the language that clinicians use and how it can be helpful or a hinderance. I take a look at the use of metaphors and offer my opinions on how they can be interpreted, when they can go wrong and how we could make better use of them. Finally I share my views and evidence on beliefs and behaviors and how they contribute towards the pain experience. Thanks again for reading, please share your comments here or on the facebook and twitter pages. Next Pain: Part 4: What’s in a word? I am sure I am experiencing allydonia, and hyperalgesia , after being on non steroidals for 15 years, and now oxycodone for 3 years at a very low dose,(5mg/bid).The cause of my pain is lower back, 1st episode was at age 25 I am now 69. I had c567 fused and it helped with the cervical symptoms, but most of my career I worked, through the lower back pain with nonsteroidals (many tried) oxyprozin was the best for me. Now I have a GP who is reluctant to work with me, as stated above I am on a very,very low dose for a 204 lb man. my appointment to discuss dose is Sept 26,2016. The original rx was for 10 mg /6hrs. I may have to go to the surgeon that prescribed, it and mention the heart specialist that stopped the non steroidals. Thanks for your articles. The whole damn country is down on oxycodone that helps, you need somthing if you hurt and pain is ruining your life. I even got a letter from the surgeon general (Vivek H. Murthy) telling me we have to get this drug under control Give me a break..
Hi Kingsbury, I’m sorry to hear about your journey. Thanks for reading my blog posts. I hope they have helped in some way to provide you with a better insight into what pain is. Perhaps seeking out a PT with knowledge of pain management in your area may help improve your coping strategies. All the best. Let me know if you need any further advice.